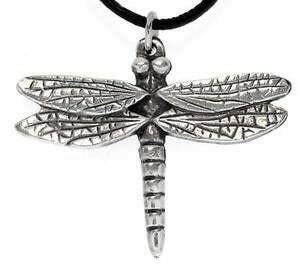 This exquisite Dragonfly Pendant is highly detailed with the design on both sides. It is handcast and hand-finished in solid American Pewter with a shiny finish resembling antiqued sterling silver. 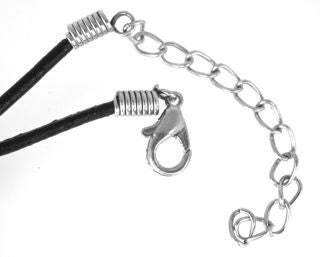 The Dragonfly is on an 18" genuine leather cord with a lobster claw clasp and 2" extension chain, or you can request one of our additional necklace options below. In Ireland and parts of Europe, dragonflies were associated with fairies. Some fables and fairytales told that if you followed a dragonfly, it would lead you to fairies. Others said that they were the steeds of fairies. The myths around dragonflies often lead to a magical place. 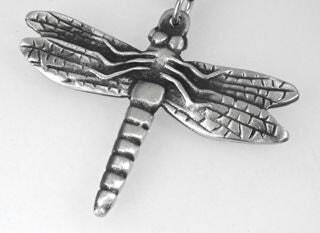 Dragonflies are so full of spiritual energy and magic that they represent the ability to travel between dimensions.